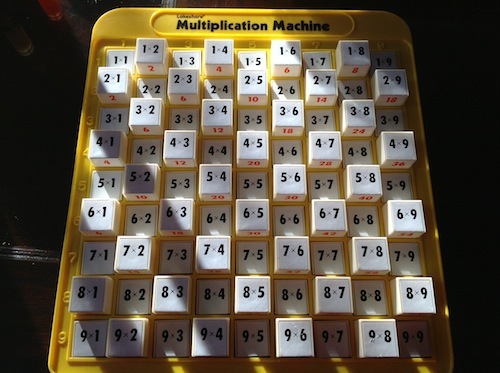 I am excited to see more and more people working hard to connect students’ informal mathematical thinking to the more formal work of schooling. The emphasis in the school-home relationship used to be on helping kids do homework (as parodied in these five seconds of the newest Incredibles trailer). No more! These days there are plenty of projects that seek to stimulate children’s math minds in ways that parallel what we do with literacy. I’m thinking of the beautiful work of The Museum of Mathematics in New York City, and of Dan Finkel’s Prime Climb and Tiny Polka Dots games. I’m thinking of Malke Rosenfeld’s work, and of Bedtime Math and their associated research at the University of Chicago. and I’m thinking of Table Talk Math. I’m thinking also of Eugenia Cheng, whose How to Bake Pi does for adults what I want parents to do for kids—show how their natural ways of thinking about their everyday worlds are deeply mathematical. Some of the momentum for these projects can be traced back to the Cognitively Guided Instruction (CGI) research at University of Wisconsin, which demonstrated that when teachers know the informal ideas about numbers and operations that kids bring to school, those teachers are more effective at helping students learn the formal mathematics of school. The copyright on the first CGI book—titled Children’s Mathematics—is 1999, and it documents research that had been going on for some time before that. Many of us doing this work now are deeply influenced by this work. Progress on this sort of thing is slow. Time spans are measured in decades, not months or years. But it’s a vibrant space that’s growing. I am optimistic. Now for the point of today’s post. I want to recommend a delightful new book, Funville Adventures by A.O. Fradkin and A.B. Bishop, and published by Natural Math. Funville Adventures involves a series of characters in a fanstatical land. Each has a magical power; these powers interact. You think you’re just following some fun and silly adventures on the playground; really, you’re thinking about one of the most important ideas of higher mathematics—functions. Yet true to the nature of most of the projects I discussed above (and to the nature of this blog), it doesn’t matter whether you know about the relationship between the story and the mathematics. If you do, that’s great. If you don’t but are curious, there’s an addendum for that, and if you just want to stay at the level of the story, you’ll exercise your math mind thinking about the relationship between growing and shrinking, the relationship between doubling and halving, and why flipping upside down has no sibling. Funville Adventures should be in every Talking Math with Your Kids-friendly library. I supported it as a Kickstarter; I’m a big fan of A.O. Fradkin’s blog. The book is on sale right now. More info and reviews here. It has been a long, busy semester for me in my community college work. Many interesting and productive projects, lots of interesting and challenging teaching problems. But I am tired. Wiped out and exhausted. This plan worked beautifully for about five minutes. She was working through some addition facts when it occurred to me that I had never asked her one of my favorite math questions. So I wrote the following in my notebook. Me: What goes in the box? Hey! This doesn’t make any sense! T: 8 plus 4 is something, then plus 5? Me: What does the equal sign mean? T: Is. Like 2 plus 2 is 4. Me: What about this? Would it make sense to write 2 plus 2 equals 3 plus 1? I let it go and we move on with our evening. Later on, though, after putting on jammies but before toothbrushing, I follow up. Me: Tabitha, I want to ask you a follow up math question. Me: Does it make sense to say 2 plus 2 is the same as 3 plus 1? T: Yes! Of course! Easy! Me: Can I let you in on a little secret? T: A secret secret? Or not really a secret? Me: Not really a secret. But something you might not know. Me: The equal sign means “is the same as”. T: Of course! I know that! Me: But that means it would be OK to say that 2 plus 2 equals 3 plus 1. But doing algebra requires that we understand the equal sign to mean is the same as or has the same value as. Tabitha is in first grade, though, so she has lots of time to learn the correct meaning, right? Sadly, older students in U.S. schools do worse on the task I gave Tabitha than younger ones do. The good news is this: If we are aware that children may develop the wrong idea about the equal sign, it is easy to help them to get it right. You can follow Tabitha’s and my adventures in equality in the coming weeks. If you have a school-aged child of any age, pose that task above. No judgment. No hints. Report your results below. It’ll be fun! Coincidentally, a fourth-grade teacher wrote up his class’s explorations in equality today. If you’re interested in what this can look like in school (easily adaptable for homeschool), head on over. In the thick of the holiday season last month, Griffin (9) turned his attention to the mythical midnight on New Year’s Eve. Griffin (9 years old): Can we stay up until midnight on New Year’s Eve? It is a nice touch that he includes his sister in this request. They may argue but they are a team. G: We can when we’re 12. At one point a year or two ago, he forced me to commit to the age at which he will be allowed to stay up to welcome the new year. The future me may be angry about the commitment I made, but for now it is paying dividends. G: When I’m 12, I’ll get to stay up a lot later every night, since my bedtime is a half hour later every year. I’ll be able to stay up until….10. Me: We’ll see about that. Griffin restates his rule. I am pretty sure that I never endorsed this rule, but he is committed to it. I figure that I may as well exploit it. Me: By your rule, what will your bedtime be when you’re 18? 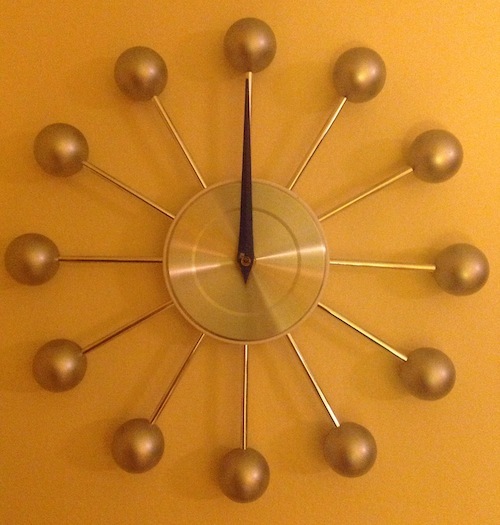 G: Twelve to eighteen….so…three more hours…One o’clock! Me: I should have asked about an odd number. How about when you’re 21? G: Two-thirty in the morning. Me: By your logic, what would have been your bedtime when you were 1? G: Well, at 8 it was 8, so…4 hours…Four o’clock! Me: I disagree. I don’t think it should be 4 hours from 8 to 1. G: It’s eight years, which is 4 hours. Me: I don’t think 1 is 8 years younger than 8. G: Oh. Yeah. Four thirty. Then when I was 3, it would have been six o’clock. G: Did I go to bed at six when I was three? Me: I honestly don’t know. We make sure your bedtime matches your need for sleep. This conversation exemplifies an important Talking Math with Your Kids principle—use whatever interests your children as an opportunity to talk about math. Another related principle is to use the conversation you don’t want to be having as a launching point for math talk. I assure you that I am a relatively normal parent; I dread discussions of bedtimes. There is so much opportunity for whining, wheedling and comparisons to classmates. I understand that these classmates are mythical, but my children assure me that they all stay up later. The key moment in this conversation was when I grabbed the bull (as it were) by the horns and asked him to apply his rule. What will your bedtime be when you are 18? That question got us talking about some good math, and it turned a potential power struggle into a fun conversation. I missed two opportunities here. It is a good idea to ask questions that make kids think in the opposite direction. So I should have asked something like How old will you be when your bedtime is midnight? This would force Griffin to think bedtime-to-age when he has been thinking age-to-bedtime. The other missed opportunity is to play with the silliness of extending this rule too far. I could have asked, How old will you be when your bedtime is 8:00 p.m. again? If his bedtime keeps getting later, it’s going to come back around. Could he work out that this would require 48 years? Or would he reject the question as silly and put a limit on his rule? Either way, it’s a productive math talk to have. Anytime your child wants to enter a negotiation, there is an opportunity to turn it into a math talk. How many M&Ms can I have for dessert? How many pumpkins can we buy? When can I stay up later? How many friends can I have at my sleepover? All of these and more are opportunities to ask what if questions involving rates, predictions, past and future quantities. So don’t dread the negotiations. Take advantage of them! 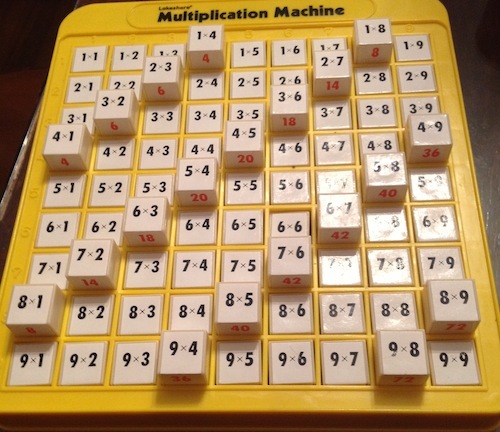 Tabitha (6 years old) has been playing with the multiplication machine off and on for a few months now. 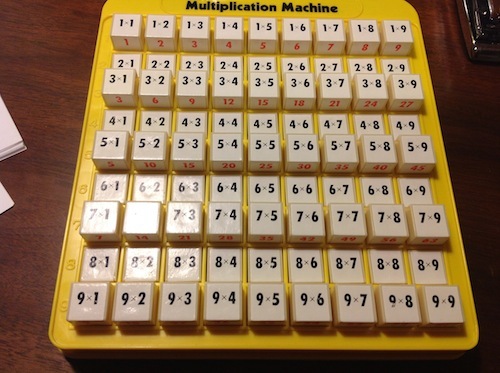 We have never once used it for learning multiplication facts, but we have had a ton of math-learning fun with it. Recently, she carefully did an up-down-up-down pattern that she continued along all of the columns. We discussed her patterning a bit before I sent her upstairs for her bath. I followed behind and, when I knew the machine was out of reach, asked her a question. Me: You know how some buttons are up and some are down right now? Are there more ups or more downs? Tabitha (6 years old): There are the same amount. This was the answer I expected. As we will see, her reason for the answer surprised me. T: I did two patterns. Up down up down… and Down up down up. Let me show you. Me: OK. In this one column [I point to the first column on the left], are there more ups or downs? T: [She counts each type] Downs. But in this one [the next column to the right] there’s more ups. Me: So how about the whole thing? I’m gonna figure this out. T: Watch. [She points to columns as she counts, one column for each number word] 1, 1, 2, 2, 3, 3, 4, 4, 5. Me: Right. But what does that mean? T: One. There’s more downs. Then one. There’s more ups. Then two, and two, like that. But five is more downs. Me: Wait. One has more downs, then the other one has more ups. So together the 1s have the same number of ups as downs? T: Same for the 2s and 3s and 4s. But 5 has more downs. Me: So there are more downs total. Me: I have a challenge for you. If you can, try to make a pattern that has the same number of ups as downs. But not now. Now you have to get in the bath. We have to keep an open mind when our kids are telling us what they think. I knew there were more downs than ups because we started with a down in the upper left. Moving across the row, there is an up for each down. The last down at the end of the row has an up at the beginning of the next row. Every down has an up. Except for the bottom right corner. That down has no up to pair with. So there are more downs than ups. This is not at all how Tabitha saw it. 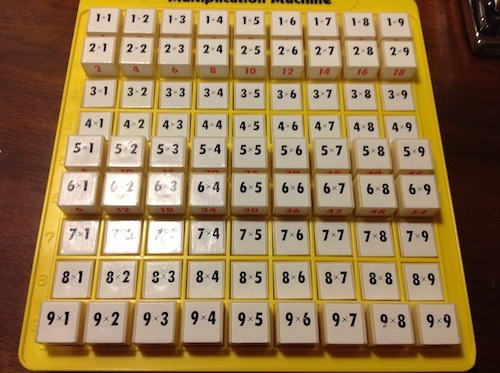 She made groups—each column has an extra up or an extra down. Then she grouped these groups—each pair of columns has equal downs and ups. By keeping an open mind, I was able to listen to her thinking. This let me ask follow up questions, which helped Tabitha make her own thinking better and more clear. I try as much as possible to have explain your answer be about convincing each other of something. You think they’re the same? Convince me. You think there are more downs? Convince me. Patterns. Notice them. Play with them. Ask about them. Any repeating pattern will do. We started thinking about it when we didn’t have the machine in front of us. I would have been content if Tabitha had counted 41 downs and 40 ups. But I was very much hoping to push her to use the pattern she had created to reason rather than to count. 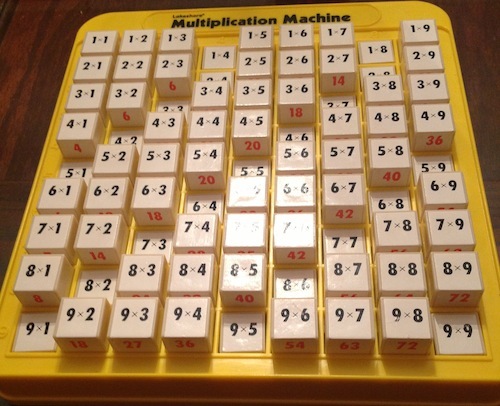 We have in our house a thing called the “Multiplication Machine”. It is a flash-cardy sort of thing. 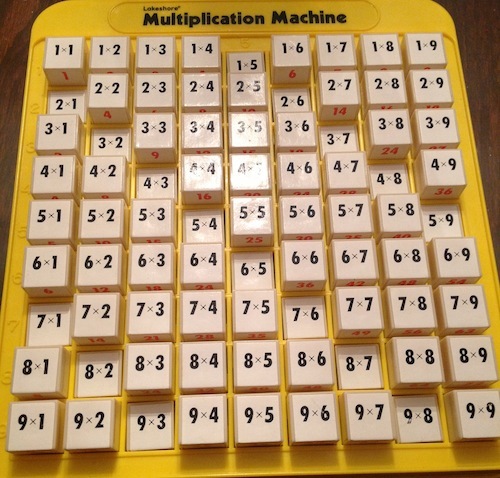 The multiplication facts are written on top of a 9×9 array of spring-loaded buttons. You press one and the button pops up, revealing the product. You can buy such a thing at your nearest teacher supply store. Ours came from Lakeshore Learning. 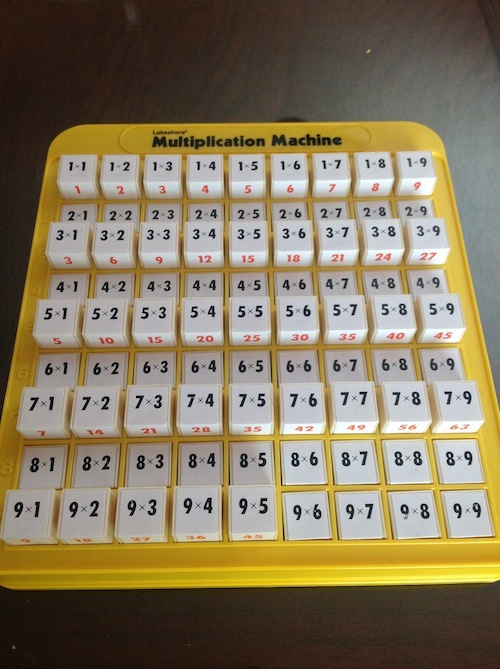 Talking Math with Your Kids is dedicated to helping parents and other caregivers to identify the mathematical opportunities afforded by everyday life, so we will not discuss here the traditional, intended use of this product (which is drilling and reviewing multiplication facts). No, I want to talk about this thing as a toy. Tabitha was hard at work pressing buttons on the Multiplication Machine the other evening. When I peeked in on her, I saw a scene that looked an awful lot like the one below. 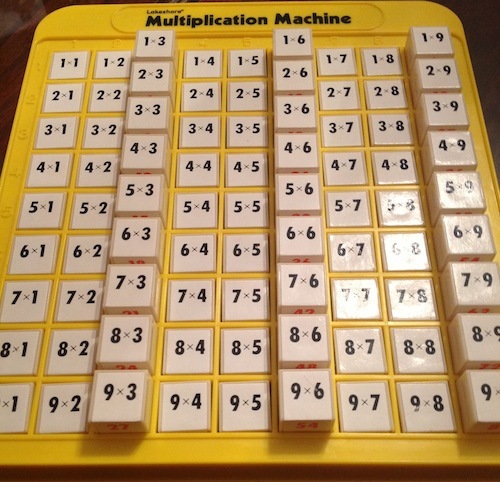 She was playing with the arrangement of up and down buttons, not with the multiplication facts written on them. Patterns are tons of fun. So I went with it. We developed the up, up, up, down pattern. We went across each row from left to right, top row to bottom row, as you would read a book. We developed its opposite—Down, down, down, up. We developed the Up, up, up, up, down pattern. This proved much more difficult for Tabitha, as she could not subitize the four ups. 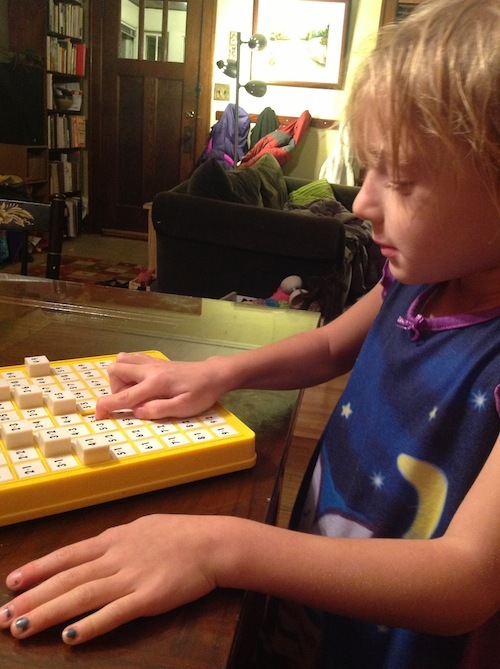 She counted them on her fingers, which she also needed for pressing buttons. She worked it out, though. Before executing this last one, we noticed the right-to-left diagonals we had gotten from the Up, up, up, down pattern and predicted what we thought would happen when three ups became four. She correctly predicted the left-to-right diagonals, but I do not know why she predicted this. We have not yet investigated the down-down-up pattern together, but I suspect she will get a kick out of it. What will happen with lots of different combinations of ups and downs? What if we do columns instead of rows? Are there any patterns where you cannot tell whether the person did rows or columns? What if we follow a path back and forth across the rows, instead of starting at the left-hand side of each row? What if go right-to-left? Or bottom-to-top? Griffin (eight years old) and Tabitha (five years old) were discussing the day’s activities. The feature activity had been making brownies with Mommy. This occurred while Griffin was out of the house. Griffin: How many brownies did you make? Tabitha: One big one! Mommy cut it up. What makes this more than just a funny story is that Griffin and Tabitha are clearly counting different things. They are talking about different units. When we make cookies, everyone agrees on the unit; we know what one cookie is. But brownies are different. Tabitha seems to think that a brownie is the thing that comes out of the oven. Griffin seems to think that a brownie is what you eat in one serving. One brownie according to Tabitha. I have emphasized elsewhere the importance of the unit; that one is a more flexible concept than we might think. Fun follow-up question: Does the thing in this video count as one brownie? Anytime there are things in groups—or things being cut—is a good time to talk about units. Grocery stores usually have express lanes where you have to have Ten items or fewer. Ask your child whether someone with a dozen eggs could use that lane. What about someone with 12 apples in a bag? What if the apples are loose? When your child asks for two slices of pizza, take one slice, cut it down the middle, smile wryly and ask whether that’s OK. In all of these cases, the central question is What counts as one? Play with that question. Also, watch that video together. It’s a ton of fun.